Is your Windows logon password 30 characters long? Sorry to break it to you, but it's useless. Any intruder with physical access to your account can get his hands on your password without too much trouble. The user enters a text password that is then hashed. 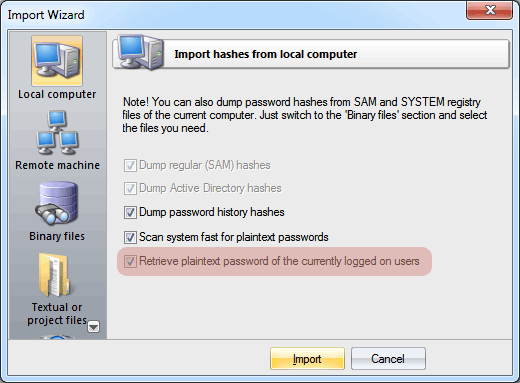 The resulting hash is compared against the reference hash stored in the SAM registry. If the hashes match, the password entered is considered correct. An unobfuscated user password in Windows 2000 can be easily retrieved by generating a simple system memory dump. In the HKLM registry tree, old Windows versions used to store passwords for automatic system logon if the relevant option was enabled. LSA secrets. It's an open secret (excuse the tautology) that LSA secrets also store personal data for automatic logon. In some cases, the original plaintext password is saved to the secrets even if the automatic system logon option is NOT enabled. This is a known issue which Microsoft has been struggling with for many years now. Our team has found that it is also present in the beta version of Windows 8. The secrets store text passwords of some system accounts as well as those of services that are launched. Plaintext user passwords can be stored in a domain if the reverse encryption option is enabled. A password reset disk (if one has been created) can be used to decrypt (specifically decrypt, not reset) the user password, which in this case is stored in the registry in encrypted form, while the decryption key is stored on the reset disk. In the beta version of Windows 8, the plaintext user password can be easily restored from the Windows Vault. Let us hope that password security will be enhanced in the final version of Windows 8. We now get to the most important part. It turns out that in all Windows versions beginning with Windows XP, the text password of the logged-in user, which is used by certain authentication protocols, such as WDigest or TsPkg, is encrypted in system memory using a block cypher, and therefore can be decrypted! The new version of Windows Password Recovery can cope with this non-trivial albeit realistic mission. To run an ordinary security audit of your system, it suffices for the computer administrator to launch the application and attempt to perform a local import of passwords, and draw the appropriate conclusions based on its results. To enhance the security of your PC, we recommend enabling the option whereby SYSKEY is stored on the startup disk or to use SYSKEY bootup password. While this will not render the decryption of the password of an already logged-in user impossible, this will prevent physical access to your computer even if a potential intruder manages to get his hands on your logon password.